Polystyrene (PS) plastic is a naturally transparent thermoplastic material that is available in several forms. The most basic form of PS is general purpose PS (GPPS), also known as crystal PS. GPPS is a result of styrene monomer polymerization and it is a transparent product. Another common grade of PS is expandable PS (EPS). EPS is a foamed version of this material, often referred to as “styrofoam” which is a name for EPS trademarked by Dow Chemical Company in 1941. This material is commonly used in packaging applications such as foam meat trays or foam egg cartons. As the name would suggest, HIPS is a form of PS that carries with it a higher impact strength. Homopolymer PS can often be brittle, and can be made more impact resistant if combined with other materials. This form of PS typically is produced by adding around 5-10% rubber or butadiene copolymer. This increases the toughness and impact strength of the polymer and results in a very stiff product ideal for packaging applications. Due to the durable nature of this material, high impact polystyrene sheet frim Impact Plastics is used in packaging applications for a wide range of applications in the food, medical, consumer goods, cosmetics, industrial and horticultural markets among others. Polymers exhibit two types of morphology in a solid state – amorphous and semi-crystalline. Whereas a semi-crystalline polymer refers to a plastic with organized and tightly packed molecular chains, the polymer chains for amorphous plastic materials are more disorganized. In an amorphous polymer the molecules are oriented randomly and are intertwined. To give you visual, the organization, or lack thereof, of the polymer chains for amorphous materials are often compared to a plate of cooked spaghetti. Amorphous polymers like HIPS are isotropic in flow, meaning that shrink uniformly in the direction of the flow and transverse to flow. This typically results in less shrinkage and less warping than semi-crystalline polymers. Amorphous polymers are typically transparent, however HIPS is a translucent white in its natural state. HIPS is available in FDA approved grades and is compatible with food packaging applications. The rigid nature of this material makes it ideal for food packaging applications such as cookie and bakery trays or deli sandwich clamshells. While the moisture vapor transmission numbers aren’t as good as with other polymers, HIPS has inherent moisture barrier properties that make this material suitable for short shelf life products. In addition, improvements to particular grades of HIPS have resulted in good environmental stress crack resistance (ESCR), making this material suitable for the packaging of fatty foods such as butter. This material can be used in low-heat food packaging applications but it is not recommended for applications where the packaging will undergo heat higher than approximately 185°F. High impact polystyrene can be decorated using a variety of printing methods including screen printing, offset lithography, and flexography. This material is compatible with corona treatment processes which helps mitigate problems with adhesion to the plastic. 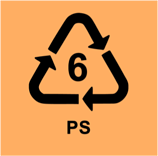 HIPS is a 100% recyclable material and is identified by the resin ID code ‘6.’ However, while HIPS and other forms of PS can be recycled, not all recycling centers and municipalities in the US accept this material. According to the 2015-16 Centralized Study on Availability of Recycling, it is estimated that between 20 – 60% of the US population has access to recycling programs that accept PS products such as cups, containers clamshells and lids, while less than 20% have access to programs that accept PS cutlery, Foam PS trays/containers, foam clamshells, and other EPS packaging. Impact plastics offers a recycled grade Utility HIPS for non-FDA applications. Interested in learning more about our HIPS products? Download our HIPS data sheets!